What material would you use when building your own round pen for horses? As you have noticed there are quite a few options when it comes to building a round pen. Taking a look at how you are going to use the round pen as well as the climate might help you make your decision. While I was training in Ohio I had a round pen made from the metal panels. 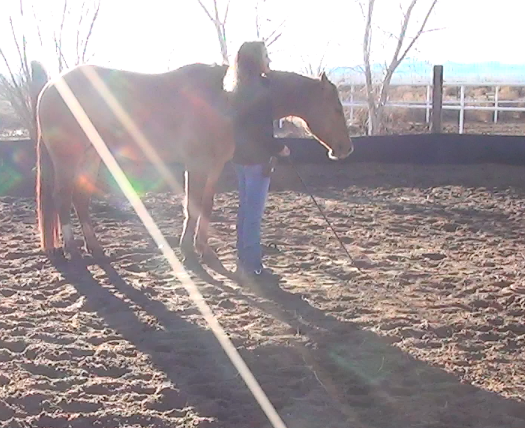 You can see this round pen in the Stacy’s Video Diary: Jac series. The reason I chose to use this type of round pen was because I knew I was going to need to use it in my indoor riding arena when the weather was bad outside. I dreamed of having a covered, enclosed round pen but it was never in the budget. The advantage of having the portable panels was that I could also move the round pen to my outdoor arena when the weather was good. The biggest advantage for me was that I could take the round pen down when I needed to drag the footing. I have had the opportunity to use a few enclosed round pens and the one issue that I have seen was when people don’t plan for how they are going to maintain the footing inside a small pen. Without proper maintenance the footing can get extremely packed and it can also become very sloped, like a bowl, which makes it more likely for a horse to trip. Be sure that the pen has a gate large enough for a tractor or drag or whatever equipment you plan on maintaining the footing with. I have also used round pens with solid walls half way up and all the way up. One advantage of the solid walled round pen was that the horses were very focused as they couldn’t look out. One disadvantage was that no air could get in, during the summer months it was like an airless desert. The pens that had solid wood bottoms and then bars above allowed for air movement. The round pen in this photo was at one of the horse motels we stopped at along our trip. It was in New Mexico and they wanted to maximize airflow so they used the mesh wire but they also wanted to minimize the sand blowing out so they added a row of industrial belting, similar to a rubber mat, as a lower barrier. After using it for awhile they decided they want to add another layer of the belt and they think it will still allow enough air flow. Consider how you want to use your round pen, what type of footing you will use and how you will maintain it, and what materials are available and will hold up well in your climate. Have you built your own round pen? Where do you live? What materials did you use? Are you happy with the results? I built one using lawn timbers for rails. It was 50′ feet in diameter, with a 6′ gate, as well as a 12′ gate (for unloading really unruly horses directly into the pen from a trailer). I left enough clearance under the bottom rail to allow for an escape route out of the pen if things went bad. The whole project cost me less than $600.00. I was able to turn some horses that would have otherwise been put down due to their aggressive nature into descent, kid friendly, working horses. One thing I learned is that the pen must have high fences. Impossible to put pressure on a horse if he could just hop over and be gone. My pen is 1.2m (3′ 9″) and it is quite low. The pen at work is about 4′ – 4’3″ and is much better; I have only ever seen one horse jump clean out. Metal panels with plywood as visual barrier. Check with the professionals at equine concepts LLC , they specialize in round pens and also fabricate the Equi cover. I have seen railing made of old fire hose. Can’t remember how it was attached to the posts, but it gave the look of post and rail but safer for the horse. I live in NW Colorado. There were two round pens on this property when I moved here. They were probably intended for sorting cows, but I have used them for the horses. There is plenty of room for our medium and small tractors to work the ground. One thing to note: make sure your vertical posts are on the OUTSIDE of the other material (if you use posts). The posts being on the inside could smash your knees, or the horses shoulder or hip. On a similar note that would warrant planning–most horse folks also need a place for HAY. We have a hay business, in which several deliveries we make have us scratching our heads. The clients often have a beautiful home and property, but do not plan for vehicles coming in with things such as hay. We have a GMC 5500 and a 24 foot trailer (tongue pull) that we haul 343 bales on, or a larger gooseneck trailer that we pull behind a GMC pickup (about 200 bales). MANY times we hear something like, “I want my hay in that far back stall.” or “Let’s carry these bales up this ramp….hmmm maybe 1/2 the load in the loft and 1/2 the load down below.” We had one client that called my husband when they were ready to build a hay storage area to ask his advice. Even with a small turn around area, she built an open-faced shed (kit from a home supply company), and her husband added sliding doors for a WIDE opening. We pull up right beside the shed and throw the hay off the side of the truck, then pull up and throw off the side of the trailer. Most horse people welcome others coming to look at their horses and property—-look at lots of “what has worked” ideas others have used! Not having a lot of money, we used what we had on the farm … wooden fence posts and 1×5 fence boards … only 3 boards from top down on inside, spaced so that a board is at stirrup height so you don’t get a foot caught on post when horse is way too close … and perfect to use to mount/dismount if there is any need. 60 foot diameter … and our is outside in my “arena” … which does have some slope, so horses do get a bit of extra workout … and placed so that you can ride right around the outside between arena fence and round pen … one section with ground poles to walk/trot over and one section with little ‘bridge’ to go over. Next to round pen, weave poles comprise one side of main riding area to provide more interest. Whole arena area used to be small stud colt/ stud pasture … so all grass. Love having ‘open’ view from round pen, as I have one horse who needs to be with a buddy, and she can go in arena when I work in round pen, or in round pen when I am riding in arena. Great use of space!! When I lived in Idaho, I built a round pen out of rail road ties for posts and half logs for rails. I used rubber mats from the ground up approximately three feet high. I adopted two Mustangs from the BLM (yealing and weanling) so the round pen was eight feet high. It had two gates in it so I could run the horses in and then out of it until they were trained. I loved my round pen! We live in northern WI. We were able to get landscape timbers for a reasonable cost and we used those with 1 by 6s for the rails. It was a good choice for us as we could also use it for a turnout if we needed to get them to a different spot when things we damp. The air flow was good in summer. Would have preferred the movable panels but, the cost for us was prohibitive. Not sure what we will do this time. We will be building another at our new place soon. Panels are the best option. ;; would not use any wood of any type. ; be on the safe side, and use the pipe panels. we live in arizona, our round pen is built under a huge mesquite tree for shade, we used horse wire and rail road ties for most of it and piping around the top we love it, it also is used for when the rain gets bad and washes out the corrals. lol. Roundpen talk!!! Love it. We have one at my place now, panels for about 1/2 and tires for the balance. Agree the moveable ones are Ideal if you want to make switches from indoor to outdoor. Best one I ever saw for starting colts though was way back in my dim past. Solid Tires (taint purty). No horse could get hurt, climb, no distraction. For the serious person training colts it is awesome. (Tires are free!). but for most situations the panels work perfect and cost effective. p like the tire idea. might have to try that. I use a Priefert round pen! It’s sturdy, durable, and moveable! You can’t go wrong with Priefet products. Oh, and I live in Texas!